Bird Fleming is a professional percussionist, educator, and performer. He is well versed in many styles of ethnic percussion: West African, South American, and Caribbean. He has studied with Simbo Wushu, Dennis Lee, Bernard Wry, Agustin Romero Diza from Havana Cuba, Cheikh Gueye, Zak Diop, and Abdullah Camara from Senegal, West Africa; El Hajjii Abubakari Lunna-Wombie and Guideon Foli Alorwoyie from Ghana; Moacyr Machinni, and Marcus Santos of Brazil. Bird has performed with Babatunde Olantunje, Gil Scott Heron, the Temptations, and Larry Harlow. He has recorded with the BCR band, Imam Bilal Hyde, and Gerald Trimble. As founder and Artistic Director of the Traditional Music Society, he is not only an educator and performer, but also a world music liaison for area educational organizations. He has collaborated with many institutions in the Kansas City area such as the Kansas City Missouri School District, St. Vincent's Operation Breakthrough, the Kansas City Friends of Alvin Ailey, Young Audiences, Accessible Arts, the Jackson County Family Courts, the American Jazz Museum, the Kansas City Art Institute, and the University of Missouri-Kansas City. Additionally, Mr. Fleming had the distinction of assisting with the development of the core music curriculum for the Kansas City School District as ethnic music advisor in 1996. Mr. Fleming holds a bachelor's degree in Political Science from Park University of Kansas City Missouri and a master's degree in Interdisciplinary Studies and a certificate in African American Studies from the University of Missouri in Kansas City. He currently teaches World Music as an adjunct professor at Longview Community College in Lee's Summit, Missouri. Ima Terri L. Brown, hails from Cincinnati, Ohio. She is one of the most skilled, knowledgeable and enthusiastic persons in her field of West African and Inter-Cultural Dance�a specialist and consummate educator. Her dance training encompasses the following techniques: Ballet, Horton, Graham, Cunningham and Dunham modern dance. She has been a student of notable instructors such as James Truitt, Thelma Hill, Percival Bordes, Talley Beatty, Lucille Ellis, Katherine Dunham, Abdoulaye Camara, Mor Thiam, Assane Konte and privileged to perform with many more. She has made intense study of cultural dance, music and songs from the African Diaspora. She has enjoyed an extensive performing career with Dansi Dance Ensemble, CoSaan West African Dance Company and The Katherine Dunham Performing Arts Training Center. Ima Terri Brown has toured throughout the U.S., Central America and West Africa as a performing dance artist. She has taught at several universities and performing arts schools in the United States as an adjunct dance professor. The past eleven (11) years she has been devoted to teaching dance in the Kansas City Public School as a Cultural Arts Facilitator at the Afrikan Centered Education Collegium Campus (ACE) and holds a BLA from UMKC. 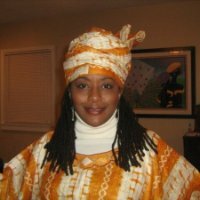 Ima Terri Brown currently administers the arts and education program at Genesis Promise Academy in Kansas City Missouri through the Traditional Music Society. She is also works in the capacity of Program/Dance Coordinator with the group Soundz of Africa. Her life is dedicated to spreading the gifts of life thru movement! Patrick Alonzo Conway is a percussionist, wind player, and composer. He has studied with such noted Master Drummers as El Hajjii Abubakari Lunna-Wumbie, Frisner August�n, Felipe Garcia Villamil, Alejandro Carvajal, and Ketut Ged� Asnawa. Mr. Conway has traveled to Cuba to research Afro-Cuban folklore, holds a MM in Composition from the UMKC Conservatory, and was a founding member of NewEar Ensemble. He has performed with the Gillham Park Ochtet, Grupo Aztlan, City in Motion, and Wee Snuff, and works with Paul Mesner Puppets, the National Audio Theater Festival, Kansas City Young Audiences, Traditional Music Society, Mambo DeLeon Orchestra, Brad Cox Ensemble, People's Liberation Big Band, Terrestrial Consort, Goat's Ear, and BCR. Conway was Music Director and performer in the UMKC Theater Department's MFA production of Rita Dove's The Darker Face of the Earth. His composition Sekar Purwa Pascima has been read by Kaliungu Kaja Banjar Gamelan, in Denpasar, Bali. Conway is director of the Balinese Music & Dance Troupe, Gamelan Genta Kasturi, and has traveled to Bali to conduct field research. Mr Conway holds a master's degree in composition from the Conservatory of Music at the University of Missouri Kansas City. Pablo La Rosa, a native of Cuba, is a musician, writer, and photographer. His collection of short stories, Forbidden Fruit, was published by Arte Publico Press in 1996. He has received numerous awards for fiction and poetry, including the Cintas Fellowship and the Seaton Award. His photography has appeared in literary magazines and textbooks such as New Letters, Chouteau Review, and Kansas Quarterly. Pablo has studied and performed Brazilian guitar music with Luciano Antonio, Afro Cuban drumming with Agustin Romero Diaz, and Brazilian percussion with Bird Fleming and Moacyr Machini. As a vocalist, he is conversant in Spanish and Portuguese lyrics. An original member of Young Audience's Trio Folklorico, he performs with several ensembles, including Manos, Maus do Samba, Trio Tropical, and The Latin Touch. Pablo is passionate about travel, having visited 25 countries at last count. His most recent travels have taken him to the Peruvian Amazon, Machu Picchu, and Lake Titicaca. His journeys allow him to learn new music and acquire new instruments that he incorporates into his repertoire. Mr LaRosa's academic achievements includes a master degree and an ABD, in Latin American Literature from the University of Kansas in Lawrence Kansas. Xavier Fleming is a saxophonist, producer, and percussionist. His studies are rooted in the percussion of West Africa, the Caribbean, and Brazil. His teachers include Cheikh Gueye, from Senegal, West Africa, Fahali Igbo, Danny Hinds, of Barbados, West Indies, Weedie Braema, Gregory Ince, Terri Brown, Mr. Babba Ali, and his father, Bird Fleming. His saxophone instructors include Joe Miquelon, Gerald Dunn, Todd Wilkinson, and Amahad Alladeen. He attended Paseo Academy of the Fine and Performing Arts in Kansas City, Missouri, where he earned awards for solo performances in district and state competitions. He has also performed at venues in the Midwest and the east coast, including the Kennedy Center in Washington, D.C.
Xavier earned his bachelor's degree in Instrumental Performance (Jazz Studies) at The University of the Arts (Philadelphia). While in Philadelphia, he performed with many percussion ensembles and earned an internship with The Recording Academy. 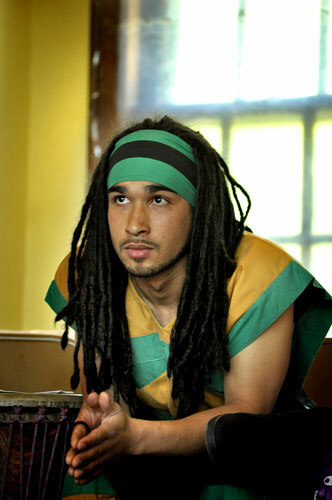 Since returning to the Kansas City, area Xavier has been performing with local reggae band AZ One and is currently working with the Traditional Music Society as a performer and instructor. Xavier is a certified music therapist, having received his masters degree in this field from the University of Missouri Kansas City.